Northern Pike are the freshwater sharks of the north and the top predator in Prairie Bee Lake. Guests catch lots of pike while fishing for other species. Northern Pike are found everywhere in Prairie Bee Lake and in the back bays you will catch them in the 2 to 6 pound range. The big trophy Pike tend to hang around points leading into bays or the mouth of narrows where Walleyes are migrating through. As a result many of our guests end up with a big surprise on the end of their line when all they were expecting was a Walleye or bass. 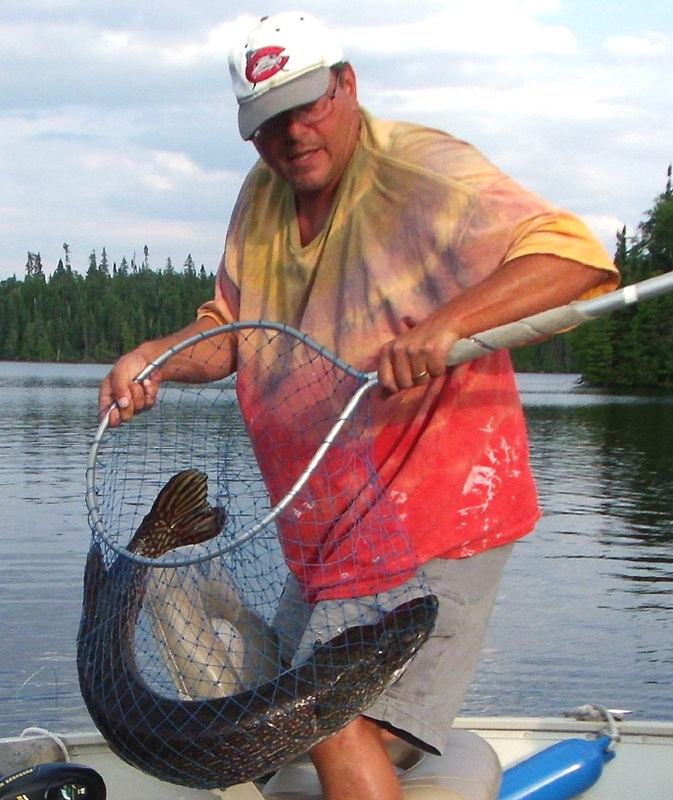 If you specifically target Northern Pike you will catch lots of them and even a couple of trophies during the week. 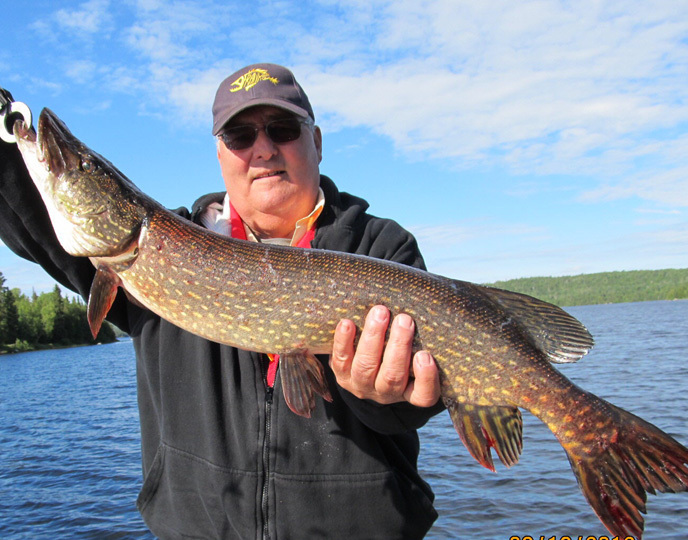 Guests have been pulling in Northerns in the 20 pound range and due to Prairie Bee Lake being a designated trophy fishing lake, catch-&-release on big pike is mandatory and has greatly improved the amount of trophy Pike being caught. The pike fishing keeps getting better and better every year. Prairie Bee Lake has an extremely high population of Whitefish. Most die-hard pike hunters will tell you that lakes with lots of Whitefish produce the biggest Northern Pike. Prairie Bee Lake is more than capable of maintaining a population of Monster Northern Pike over the 30 pound mark. When a Northern Pike reaches over the 40 inch mark their growth tends to slow down. The big massive Pike tend to go after food that is more rewarding in relation to the amount of energy they use to catch their food. Northern Pike born with the instinct to find cooler water during the summer are the pike that avoid shallow water parasites and live long enough to become massive. Their instincts also bring them deep enough to have schools of Whitefish to gorge themselves on. You will catch big pike in the shallows but the majority of the huge monsters will be down deeper feeding on whitefish. Even these big Northerns of the deep come shallow and sun themselves after a big meal to help with digestion. With this in mind, hit the back weedy bays, the rocky points and narrows and if you are not catching anything big turn around and try casting out into deeper water. A deep ridge 15 to 30 feed deep just off a shallow weedy bay with a feeder stream is the prime spot for a monster Pike to hang out during the summer and fall. Working any drop-offs into deep water where you find Walleyes will also produce big Northern Pike. From early spring to late fall casting spoons or trolling artificial baits are popular when fishing for northern pike. Your best opportunities are produced when looking for large structures that are very close to deep water. This is very productive when fishing for the larger northern pike that are looking to ambush their prey. 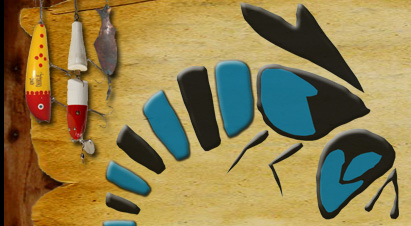 If you are looking for more action, seek out the weedbeds and work the area with artificial baits. Protected size for Northern Pike: It is camp mandatory that all northern pike 26 inches and above be returned to the water.